We understand the challenges in finding good deals on small orders for your business needs. This is why we've done the legwork, for you to reap the benefits. 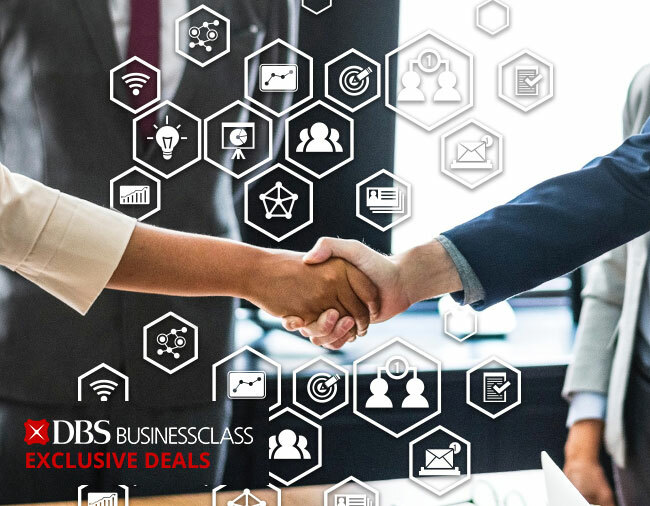 Be rewarded now with Business Deals, exclusively for DBS BusinessClass members. 3PRO Solutions help Small and Medium Enterprises [SMEs] build their digital capabilities to seize the opportunities for growth in the digital economy. One stop convenience with customised solutions from a team of professionals with over 25 years of experience. Empower your business with smart cloud accounting solution to optimise business processes to save time, reduce costs and increase profits. Trusted and adopted by SME owners. AVG is company who focus on Chinese Digital Media to outreach the Chinese Online Audience. Advocado is an Award-winning Cloud Loyalty & CRM System. 10% discount on our services. Singapore's premiere web hosting company. Established in 2003, APC Hosting provides reliable hosting solutions and infrastructure to individuals and businesses. Singapore’s largest network of practicing lawyers and the only marketing platform approved under Tech Start for Law by Ministry of Law, Law Society of Singapore. Avis is a trusted brand with a long history of innovation in the car rental industry who operates from over 5,000 locations in 165 countries worldwide. Avis is one of the world's top brands for customer loyalty, with a commitment to true convenience and exceptional service. AXTRO Gifts is a leading wholesale supplier and distributor of corporate gifts in Singapore. Ideal for individual incentives, rewards, client gifts, marketing events and company celebrations. Budget Car Rental is an industry leader in providing vehicle rental services to value-conscious travellers with approximately 3,350 locations in more than 120 countries. The CFO Centre is now the Global No.1 provider of part-time FD and CFO services. The concept was to provide the skill sets of experienced Chief Financial Officers of large corporations to the small and medium sized enterprise (SME) sector, allowing smaller organisations to benefit without incurring the expense of hiring someone full-time. DocECM - a secure cloud-based Enterprise Content Collaboration Platform and central repository. Decadence Design is a team of dynamic and creative people who are passionate about delivering top notch designs to help build your brand, spread your message and find that deep connection between you and your customers through delectable visuals that communicate. DHL is the global market leader in the logistics industry. My DHL+ promotion for DBS Business Class members to ship to 220 countries globally. Our marketing platform known as Engagement Cloud connects merchants’ systems and data and empower them to create personalised customer journeys using our marketing automation tool. Eber is a smart member solution that comes with comprehensive loyalty & rewards system, marketing and analytics too. Eminence Events specialise in Brand Activations, Experiential Marketing, Product Launches, Sporting Events, Special Events, and Meetings Incentives Conference and Exhibitions (M.I.C.E. ), engaging your target audience better with your brand by evolving with them. To help businesses stay ahead of their game, ENCE was established to group the various facets of marketing under one roof to provide clients with an integrated marketing approach. One-stop IT solution in providing the POS systems, RFID technologies and self-checkout kiosk. Exmart is a data collection company for data mining and analytics. We enable companies to leverage on big data and information technologies to boost productivity and scale faster, make better decision and drive down cost. From building industry specific contact list to monitoring trends and commodities. The source of delightful and tasty indulgence for generations. Promise to treat your taste buds with tantalizing flavours. FoodRazor provides a platform for F&B to manage their procurement process from order to invoicing. Gpayroll is an easy to use, self-run payroll service with an intuitive and automated system that helps business owners focus on their core business without the hassle of managing payroll, CPF filings, and tax declaration. Janus Academy offers tailor-made language programs to suit customer's individual needs and interests. Kobe helps companies get real, relevant people to share about their brand using social media. Microsoft Office 365 is a Web-based version of Microsoft's Office suite of enterprise-grade productivity applications. With Office 365, you can create your best work with the premium versions of the Office applications across all your devices: Word, Excel, PowerPoint, OneNote, Outlook, Publisher, and Access. MyCareerCube is an online portal to connect the trainers to the knowledge seekers worldwide. As the name suggest, it's an e-learning solutions management portal providing variety of courses on PMP, ITIL and Technical Courses. Manage your multi-channel online selling with eCommerce marketplace management software OMNA & boost profits for your online business. Optimum is an information technology solutions and services provider. Optimum’s commitment is to provide customers greater flexibility in the execution of IT projects, adapt to the agile methodologies and focus on cost optimization. Payboy eases the burden of HR Staff in SMEs by providing a system that manages leaves, claims, and attendance and payroll matters. Pegaxis is a property management platform which integrates a property services marketplace for the sourcing of quotations, with management approvals, work progress tracking and work report generation. SRDD Self Service Ordering and Payment Kiosks (SOP Kiosks) can help to increase productivity and centralised cash management for your F&B operations. StaffAny is a cloud-based solution that managers love because it helps them get their job done faster and neater. It integrates your scheduling and timesheets data. StoreHub is an iPad Point of Sale on Cloud with Inventory and Customer Relationship Management. Experience the simplest-to-use and friendliest HR software on the cloud. Talenox comes preset with CPF, tax, and SDL requirements. This means no more manual calculations for individual employees. What’s more, you can export your DBS bank files through GIRO. Tricove Tech provides Cloud Solutions such as Employees’ Time & Attendance, Leave, Employee Profile Management, Biometrics Time Attendance & Access Control, Cloud Visitor Management and other Major Cloud Solutions. UnionSPACE is a work space provider that dedicates itself to giving a place for entrepreneurs to expand their businesses in Southeast Asia. Thus, UnionSPACE does not only provide co-working space, but also a wide range of business solutions from company incorporation, serviced office, virtual office, to call answering service for its members. ViSenze visual technology - Simplify search and categorization in your image database with visual search and image recognition. Vouchermatic is a cloud based solution to implement real time mobile gift vouchers, coupons, and other gamified experiences such as digital scratch card, spin the wheel, stamp card, eAng bao, etc that captures millennial’s attention. Online platform for creating, e-signing and storing 200+ legal documents and working with your lawyers. 20,000+ business users and lawyers across the globe trust Zegal’s software to solve legal problems in an affordable and efficient way. Singapore's largest network of practicing lawyers and the only marketing platform approved under Tech Start for Law by Ministry of Law, Law Society of Singapore. Sembcorp Power has more than 15 years of experience in the Singapore electricity market. We understand that every business is unique, which is why we offer customised electricity plans and ensure seamless switching with no disruption. Enjoy the benefit of having UnionSPACE Business Passport for 6 months which include access to 100+ locations, members discounts, a prestigious business address, mail handling and meeting room access. Redeem your Business Deals now! By providing your business contact information in this form, we may periodically send you electronic direct mailers on updated information and new services relating to DBS. Any e-mail sent by DBS BusinessClass provides you with the option to be removed from the DBS BusinessClass mailing list.